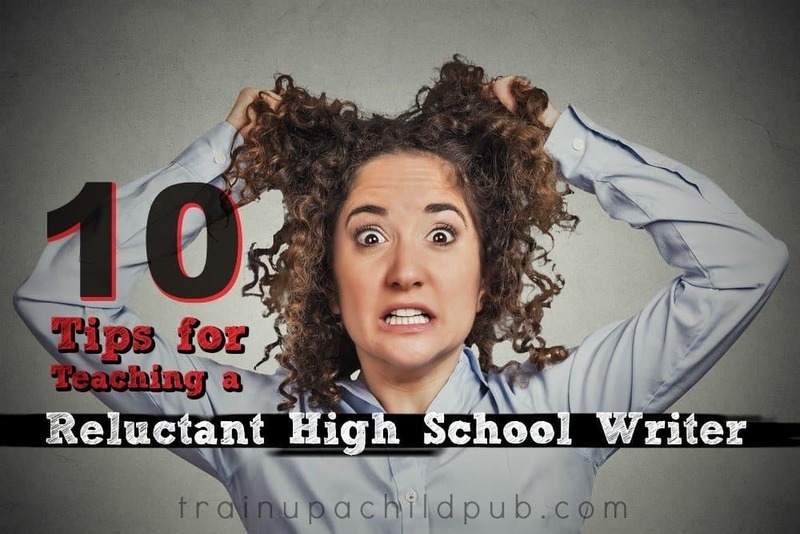 Are you teaching a reluctant high school writer this year? Battling over writing launches a whole new type of anxiety into the mix, especially if you’re teaching high school writing for the first time. The clock seems to tick faster faster and faster, and so often your student just wants high school to be over with, while all you can think about it is getting that kid prepared for and into college. Teaching reluctant high school writers to write can be difficult, to say the least! But let me reiterate…don’t panic! Our oldest was not a reluctant writer in high school. Often it was a matter of helping this student focus or narrow the writing that was the issue instead of needing to motivate this student to write. Little did we know that the next child to come along would be the opposite! If you aren’t sure your student is well-versed in the basics of writing, such as paragraph development, using correct grammar and punctuation, writing clearly and succinctly, creating a solid outline, using transitions, and editing his own work, then that is where you want to start. It’s never too late to learn and practice the basics. And the basics need to be mastered prior to heading into the more advanced topics, such as writing introductions and conclusions, crafting powerful thesis statements, and supporting those statements with solid points. This may sound intimidating if you are not a natural writer — but you can do this. *Note: Just a head’s up –recently Purdue’s Online Writing Lab has added a section under pronouns that includes “gender neutral” language. Even if writing seems scary, this is not rocket science. Writing is a just a skill, like many others you have learned and taught over the years. And how do you learn any skill? By step-by-step instruction and practice. When you’re ready to teach your student how to write the five basic high school essay styles, you can pick up our high school course, Essay Styles for High School. It has clear, simple instructions written directly to your student, with LOTS of detailed grading tips to make YOUR job easier. It even has example essays written by real high school students and instructions for grading first and succeeding drafts. 2. Use high interest topics wherever you can. This is a life saver! If your student is already curious about and fascinated by a subject, why not make your job easier by letting your reluctant writer research and write about it? My reluctant writer is a music lover, and was enthralled by guitar, especially electric, in high school. So, in order to teach research paper writing, I suggested he use the history of electric guitar as a topic, making the idea of a eight page paper much less daunting. He loved the research. Additionally, he loved talking about what he was learning, so we got some extra narration in. He learned about research, documenting sources, taking notes, organizing his information, creating a detailed outline to write from, and more — all while learning more about what he was already interested in! This whole process became painless because he was already fascinated by his topic. Is your baseball lover studying American History this year? How about writing a short report on the history of baseball? Does your student love art? Suggest your student write about impressionism, cubism, a favorite artist, or the history and creation of oil paint. Have an avid animal lover? Encourage writing about conservation efforts of endangered species or wildlife crime. Sometimes removing the focus from the writing itself and putting it on the highly interesting subject can be all it takes for a student to get the job done! Whether you realize it or not, your high school student is watching you closely. Make sure that your homeschooled students see you writing, even if it’s just email. Let him or her “catch” you reading your email aloud back to yourself so that you can edit it. For boys, it is even more important for them to see Dad or male siblings doing this. Even in this day and age, boys sometimes develop an attitude that academics, and especially writing, are “girl” things. You probably self-edit without even thinking about it. We even edit our emails and rarely send them without reading them aloud. 4. Encourage and incorporate plenty of practical writing. 5. Teach high school writers to edit their work. This skill is vital for high school students to acquire, even reluctant writers. As with all difficult areas, begin small, especially if self-editing is a new concept to your highschooler. Have your student only edit for one thing at a time to begin. I usually suggest reading for content first. Have your student ask herself: does what you write make sense? Do you need to add or clarify anything to get your point across? On subsequent assignments, add checking for correct punctuation, varied sentence structure, punctuation, etc. If you’re using our Unit Programs, there is a self-editing tool that you can adapt and use. It is on the Tools folder and in our Teacher’s Manual, in the Tools section. Begin with self-editing smaller assignments and move on to longer ones as your student begins to build confidence. So if writing has been a struggle this year, don’t panic. If you take writing instruction step-by-step and get the help you need, you’ll be fine and your student will get the writing foundation he needs in preparation for high school writing and beyond. Teaching a high school student is truly a sacrificial act for many parents. When that student is a reluctant writer, the jewels on the crown increase exponentially! Just remember that this is only one aspect of your student and that you both will make it through with prayer, patience, practice and time. God bless and know that the fruit of your labor will not go unnoticed! Here’s Part 2 with the last five tips of this post!